Justice Minister Mark Golding said today that the cabinet is supporting a proposal to decriminalize the possession of to two ounces of the ganja. Under the proposal, those caught with marijuana could be subjected to fines, but not criminal charges. Golding said the government will also draft legislation that would allow people convicted of marijuana use or possession under the current law to get their criminal records expunged. 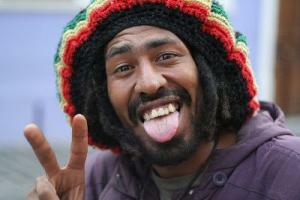 Marijuana has long been a part of Jamaican culture and is used as a religious sacrament by Rastafarians. More than a decade ago, a parliament-appointed commission recommended that the government decriminalize it, but, despite mounting pressure, that hadn't happened. Now, it looks as if it actually will. Beings above be praised, Jamaica is following suit! Brothers and sisters of the herb, rejoice today for our brethren in Jamaica for this historical moment. May the herb always enlighten your ways, and may others follow along in this momentous surge of change around our world. Many thanks to Philip Smith's intelligent reporting and the folks at StopTheDrugWar.org for a fine web site. They are making a significant contribution to the energies which are making these LONG, LONG OVERDUE changes happen. Just realized, it's Friday the 13th. Suppose I can be forgiven for not expecting to see something like this to happen in Jamaica---much less anywhere else---in my lifetime. This marks a powerful step forward to a better, more rational, and more livable world. Countless groups of people, & many aspects of society benefit from this kind of change. Not just the overburdened prison systems; not just the cannabis user who won't have to live a furtive existence, always looking suspiciously over the shoulder for the next outrage: All of society benefits when we stop wasting our resources and substance on the ridiculous prohibition 'Drug War'. A war which ought Never Have Been Started in the First Place!